Brace yourselves for the most amazing dumplings so far! 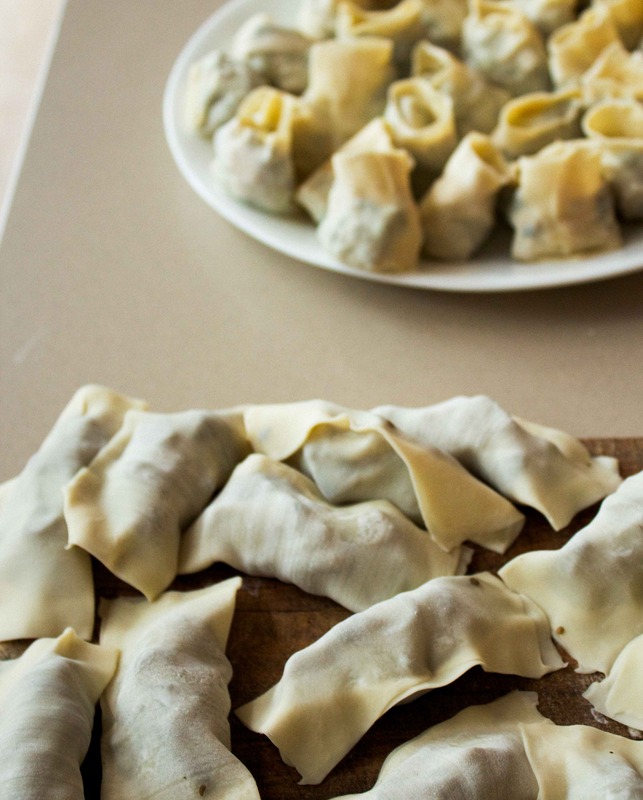 (Possibly the best dumplings…I’ve ever eaten!) Seriously. I made these, I ate one, I died. They are so. yummy. I made thirty that first day, I very nearly ate thirty in that same day. The filling is just spicy eggplant fried until soft. There’s a dumpling place near my uni that has eggplant dumplings as one of the vegetarian options, and they’re so awesome. I have a theory that eggplant is kind of a magical vegetable. How does it become so good when you cook it? Have you ever tried to eat raw eggplant? It’s disgusting. But cooked eggplant is like a whole different universe. Regardless what they look like, these are definitely the favourite dumplings so far. They are also basically the easiest, with hardly any ingredients. 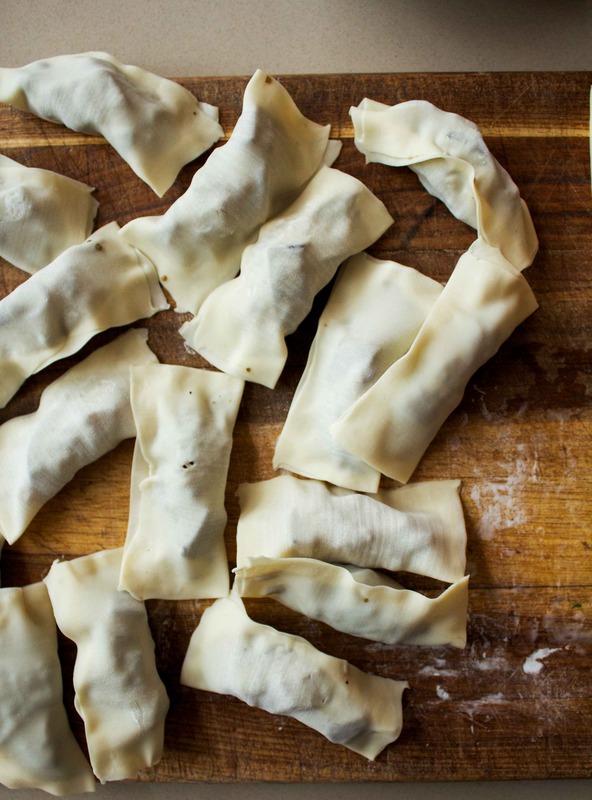 You can buy pre-made dumpling wrappers, or you can make your own. Pick your own adventure. Just make sure your eggplant is 100% cooked before you fill the dumplings because it won’t cook anymore when you’re steaming them. Enjoy!!! After salting the eggplant slices, wash the salt off and pat dry. Slice the eggplant into 1 cm strips and then 1cm squares. Heat the oil and chilli in a wok and fry the garlic, onion and shallots until soft and slightly brown. Add the eggplant, soy and vinegar and fry until the eggplant becomes soft. Add the sugar and season well with pepper (no more salt) to desired taste. Set aside and let cool completely. 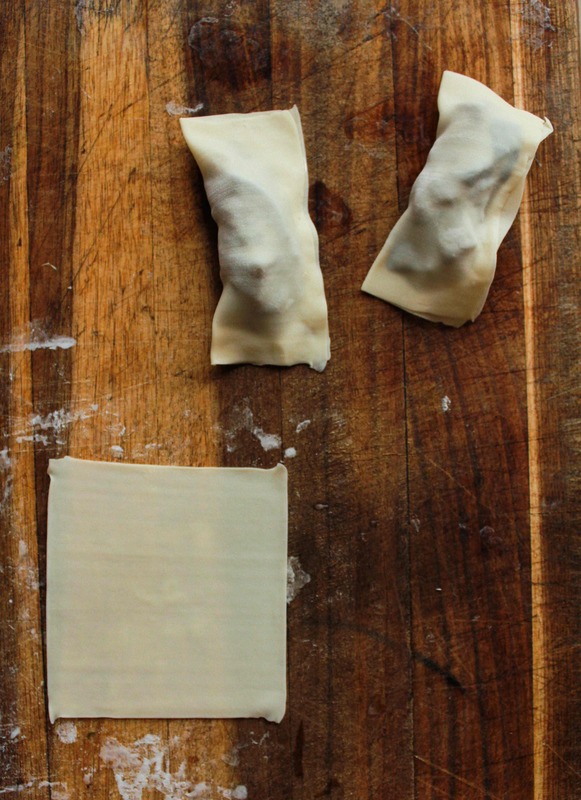 Take a small dessert spoon of filling and place on a dumpling wrapper. Slightly wet the edges with your finger and fold the wrapper towards you, pressing down the edges to seal in the eggplant. Either bring the edges together and join to make a round shape, or leave as pillows. Can be frozen and steamed for fifteen minutes, or cooked straight away until wrappers are soft. Serve with vinegar and chilli oil. This entry was posted in Healthy, savoury, Uncategorized, Vegan, Vegetable dishes and tagged chilli, dumpling, eggplant, garlic, Healthy, vegan. Bookmark the permalink. Looks and sounds delicious! You’ve made me want to scrap my plans to make eggplant parmesan. I loooove eggplant with parmesan! Lets face it I love eggplant any way 🙂 Thanks! Funny, I thought this was actually pasta, like tortellinis or something. I wonder what the difference is between it and dumplings? Look and sound delicious. Not something I’d have thought of putting a dumpling wrapper but hey! Why not? @nwand07 – basically the same idea different cultural origin. 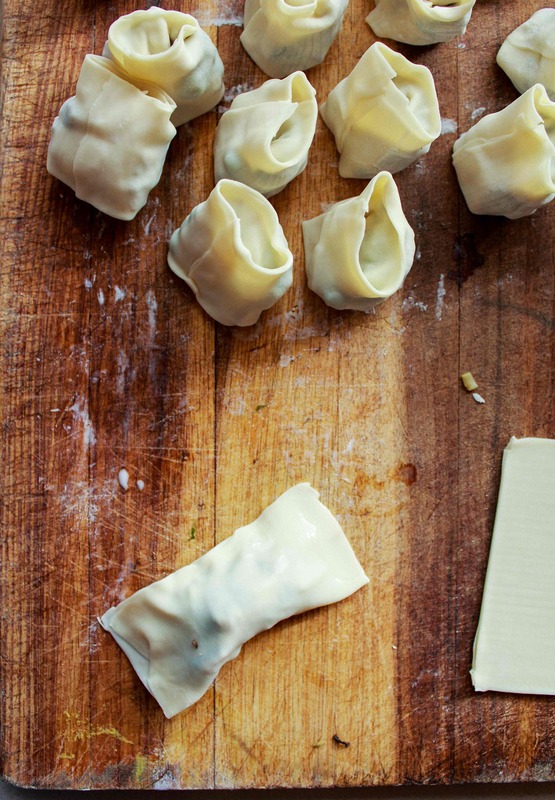 Dumpling wrappers are generally thinner than most pasta and dumplings are often fried or steamed rather than boiled. Haha! I’m looking at my screen and your pictures thinking no Lilli…just no… (: These look amazing and the filling must be wonderful. Btw Lilli!! Love the pictures ..
Yeah how is it that cooked eggplants are sooooo darn good???? I simply love them! And dumplings, I like them too. These look like heaven on a plate! I rarely eat vegetarian dumplings at restaurants- the meat ones usually sound more exciting haha…..but that’s probably because the restaurants where I eat don’t really make interesting vegetarian ones! If they served vegetarian dumplings as yummy as this I would definitely get them! 🙂 I absolutely love eggplant- though I haven’t tried raw eggplant (and am not intending to either haha)- definitely one of my favourite vegetables! The vegetarian dumplings are sadly usually the boring ones at the restaurants I go to! Although there are some good ones if you look hard enough 🙂 Thanks! I love eggplant (definitely cooked) too! I just hope u took photos of the filling, or while cooking the filling, step by step. But nevertheless, the recipe is easy, i can try right away!